The Cooler Master Silent Pro Gold 800W is particularly suited to gamers and frankly anyone looking for a bullet-proof PSU for use with their desktop PC. It delivers high-quality power to a range of system components that include PCI-E and SATA devices. This model ships with one robust 12 volt rail as standard. In specific tests, the Cooler Master Silent Pro Gold 800W achieved 100 per cent of the manufacturer's claimed performance based on real-world scenarios involving the most commonly used 12 volt rails. In terms of total efficiency, the Cooler Master Silent Pro Gold 800W was quite simply the best in its class by a long chalk, easily and decisively beating its nearest competitors; the XFX ATX Black Edition 850W and the Thermaltake Toughpower XT 775W. This PSU further consolidated its lead in terms of standby efficiency, being the best performer of five similar power supplies under test. A further strength came in the form of decibel noise, the Cooler Master Silent Pro Gold 800W beating of all contenders, including the Scythe Stronger 700W and the NesteQ Xzero 700W, making it the quietest of the PSU peer group under test. The fan performed well to appropriately vent heat, helping to keep the PC cooler on the inside than at the exhaust outlet point, and the attached cabling did not significantly heat up during high electrical load tests. The tested rails were all within the ATX-specified tolerances, definitively meeting the standard. The Cooler Master Silent Pro Gold 800W also did well in the electrical interference stakes, producing a virtually jitter free voltage printout at the 75 per cent load mark, forming a near flat line. 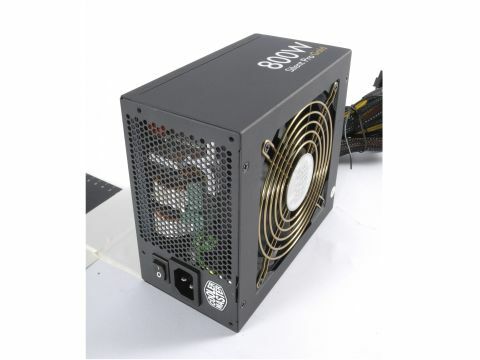 The PSU has an elegant feel to it with a black case, complimented by a gold fan grate. The build quality of the Cooler Master Silent Pro Gold 800W is generally good and sturdy. Helping it fint into any case it's a standard design measuring 160 x 85 x 150mm. While the Cooler Master Silent Pro Gold 800W is a reasonably heavy weight PSU, coming in at 2.210 kg. The manufacturers' stated AC power input is 100-240V 9-5A 60-50Hz. The Cooler Master Silent Pro Gold 800W comes with a total of 23 output connectors; 1x ATX 20/24-pin connector, 2x ATX 8-pin connectors, 4x PCI Express 6/8-pin connectors, 2x PCI Express 6 -pn connectors, 6x SATA connectors, 6x 4-pin peripheral (MOLEX) connectors, and 2x floppy connectors. Overall, the performance of this PSU was exemplary; it simply excelled in all areas. It matched the manufacturer's specifications for 100 per cent load tests and we can't recommend it enough.